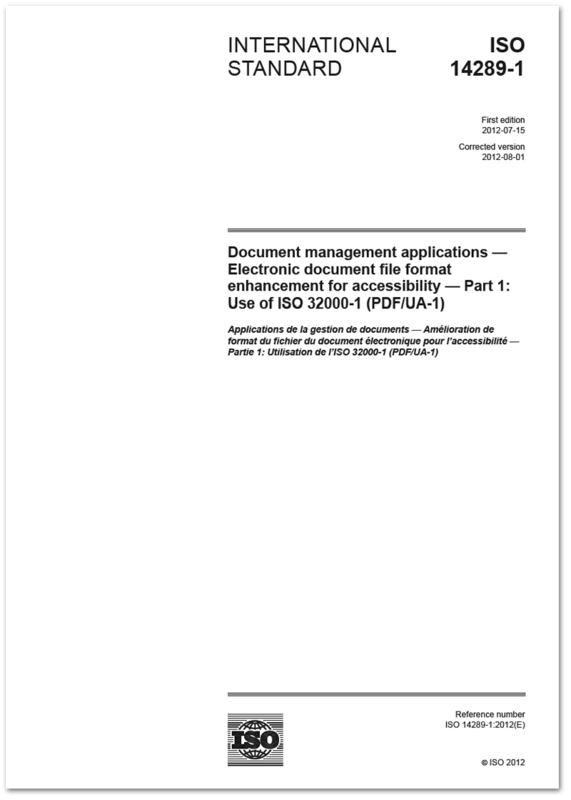 ISO 14289-1:2012 (PDF/UA) is here! Home / ISO 14289-1:2012 (PDF/UA) is here! Eight years and (at least) 145 two-hour conference-calls and 15 all-day in-person meetings later – it ships! Today – August 7th, 2012 – is the day ISO 14289-1:2012 (PDF/UA) becomes available (in exchange for 86 Swiss Francs) to the general public. As a practical matter, PDF/UA is aimed at software developers and people who want to check up on software developers. PDF/UA is not going to make Bestseller lists anytime soon, but it does provide a clear-cut set of rules for ensuring PDF electronic documents and forms are accessible. ISO 14289 is also the world’s first accessible ISO Standard (more on that in another post). PDF/UA is of interest, we hope, first and foremost to persons with disabilities who require or benefit from assistive technology in order to read and navigate electronic content. PDF/UA is for you. With PDF/UA conforming files, readers and assistive technology, users are guaranteed – so far as the PDF format itself can provide – equal access to information. The benefits of PDF/UA extend beyond people with disabilities. With support for PDF/UA, reader software will be able to reliably reflow text onto small screens, provide powerful navigation options, transform text appearance, improve search engine functionality, aid in the selection and copying of text, and more. How can you use PDF/UA? Are you looking for a international standard for accessible electronic documents and forms with specific technical requirements directly applicable to any PDF writing or reading software? Consider adopting PDF/UA as a key component in your overall accessibility strategy. Do you need to improve accessibility in the electronic documents and forms your organization produces? Ask your authoring software vendor about their plans to support PDF/UA. Do you read PDF files but need better navigation options, or reliable control of the size and formatting of text? Ask your PDF reader vendor about their plans to support PDF/UA. Do you use Assistive Technology and want better performance when reading and using PDF files? Ask your AT vendor about their plans to support PDF/UA. NOTE: Be sure you get the “final” edition – it says: “Corrected Version 2012-08-01” on the cover. Some stores may still have the initial 2012-07-15 release for a few days. International Standards do not write themselves. Many people helped write PDF/UA over the years, but there are a few who helped start the US Committee for PDF/UA or who have made very substantial contributions in the US Committee for many years. I would like to recognize them. Betsy Fanning, AIIM. As Director of Standards, Betsy’s shepherded the US Committee through almost every meeting over 8 years. Without her expertise in the standards-development process, her tireless patience and the ability to herd cats, PDF/UA would have gone nowhere. Cherie Ekholm, Microsoft. Representing Microsoft’s commitment not only to accessibility in general but to the PDF format, Cherie Ekholm joined the PDF standards world in 2007 and was elected ISO Project Leader for ISO 14289 in 2010. It may seem odd to some that a Microsoft employee chairs a PDF standards committee, but Cherie’s done a great job. She’s already busy working on PDF/UA-2! Ferass ElRayes, NetCentric Technologies. A Canadian, and therefore, only a “guest” in the US Committee, Ferass was one of the first developers outside Adobe Systems to implement tagged PDF. Ferass provided vital 3rd party software engineering perspective since the early days. I can’t say too many nice things about him, though, because we now work in the same company! Greg Pisocky, Adobe Systems. Adobe’s man in the field for PDF accessibility since the very beginning, Greg has provided volumes of hard-won experience with every sort of user and decision-maker. Apart from his experience where the rubber meets the road, Greg also took a book’s worth of minutes for the US Committee over the past eight years. Leonard Rosenthol, Adobe Systems. Leonard is PDF Architect for Adobe Systems, managing Adobe’s interest in the various international standards for PDF (six and counting, not including parts). Leonard provided invaluable deep technical knowledge of PDF to the US committee for years. Loretta Guarino-Reid, Ph.D, Google. W3C’s co-chair of WCAG 2.0, Loretta was a member of the first team of developers to implement PDF accessibility in the late 1990s at Adobe Systems. In the first few years of PDF/UA Loretta played a key early role in educating the rest of the Committee about structured and tagged PDF. Matthew Hardy, Ph.D, Adobe Systems. A relative newcomer to PDF/UA, Matthew’s done “only” about 40 meetings or so – he’s the new kid! As a computer scientist with detailed knowledge of PDF and a Ph.D thesis on logical structuring of pre-existing content, Matthew has made a number of critical contributions to the standard as it entered the International process. Neil Soiffer, Ph.D, Design Science. Known in the US Committee as “the seconder” for his characteristic role in approving Committee decisions and “Dr. Math” for his interest in making sure math is accessible, Neil’s track-record of well-considered contributions in many areas together with consistent good-natured attendance, is (almost) unblemished. Many others provided invaluable assistance to PDF/UA’s development in the US Committee or ISO Committees. Without trying to name everyone I do want to mention: Adam Spencer, Angy Brooks, Brad Hodges, David Hook, David Austin, Dennis Newman, Jon Gunderson, Karen McCall, Léonie Watson, Mark Gavin, Martin Bailey, Olaf Drümmer, Peter Abrahams, Stephen Levenson and Sean Keegan. Last but by no means least, a big thank you to Adobe Systems, for its commitment to PDF/UA, for its investment in inventing and developing tagged PDF, and of course, for inventing PDF in the first place. You can buy your copy of ISO 14289-1:2012 directly from ISO’s webstore. * – While the text of the standard itself is tagged, the ISO webstore’s record of sale – stamped onto the PDF pages at the time of purchase – is (for the moment) not. As such, while the file will fail accessibility compliance checking software, it is nonetheless well tagged and accessible – except the record of sale information.